There is no such thing as a true ‘waterless’ wash. The products discussed in this post are high lubricity cleaning agents which sometimes contain an added protectant. The composition of each formula varies by manufacturer but in general, a waterless wash should be able to clean without scratching. Am I not just rubbing the dirt all over my car? During the early days of waterless washing, damage to the car’s surface was a problem. As technology has advanced, however, this has become an issue of the past as long as proper technique is employed. Proper technique starts with a common-sense assessment of your car’s condition. Have you recently been four wheeling in a muddy swamp? Go ahead and hose off. Any caked on dirt or grime will need to be loosened no matter what cleaning method you chose. For lightly soiled cars, waterless solutions work great. The next step is to choose a towel that has deep enough grooves to trap dirt. A cheap, shallow towel or rag will provide nowhere for contaminants to go and thus drag them along the surface of your paint. If you’re buying online, just add the word “premium” to your towel search and you’ll be set. Want to learn more about Microfiber? Click here to read more. See how the microfiber towel to the left has deeper grooves? When you’re ready, work in small sections – think ‘a panel’ rather than ‘a side.’ This prevents the solution from drying out and allows you to get things properly clean. Spray your waterless wash onto the car’s surface and wipe in straight lines rather than circles. A circular motion will bring product and trapped dirt back to the area you’ve already cleaned. It’s important to check your towel frequently and switch to a different section after it becomes visibly soiled. 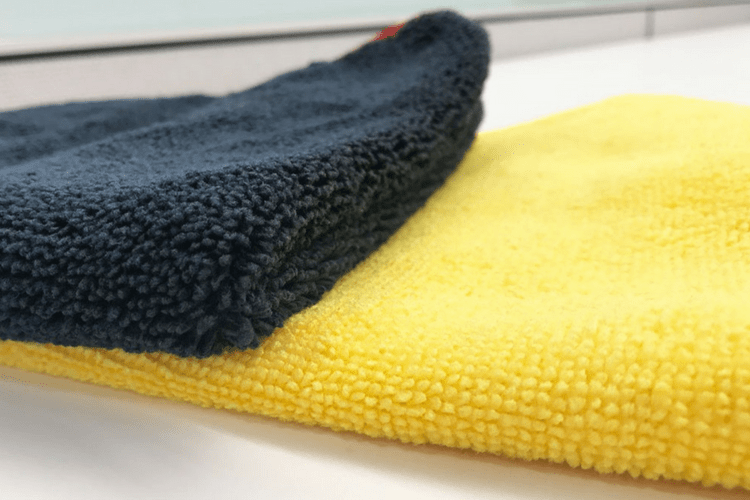 Most detailers recommend folding your premium towel into fourths which make switching to clean sections easier. Waterless Wash is safe for all wheel types, but do those last. Your wheels trap the very worst of what the road has to offer: brake dust, metal particles, grime, and broken dreams. Use a separate towel for the wheels following the same spray and wipe methodology. This question, like most product related questions, boils down to personal preference. Some products offer additional protection in the form of liquid carnauba wax or synthetic polymers. It’s important to avoid any waterless wash that contains Volatile Organic Compounds (VOCs) which means choosing a water-based formula rather than one based on petroleum distillates. Let us know in the comment section below if you’ve tried using a waterless wash product and how it worked for you! Have never used a waterless wash on my car, mainly because all of the men in my life who show cars (dad, son in law, brother, nephews) have sworn me against them due to them scratching their precious cargo. I totally understand their fears when they spend so much $$$ on their classic beauties. 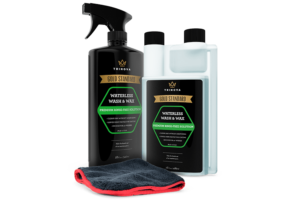 However, I have been so impressed with the quality of the other Trinova products I would have no worries trying your waterless wash on my new car. (And I would love ❤ to be able to present a quality waterless product to all of them) I know it would be very convenient for all of them who are washing something every weekend for a show, and then spot checking every inch of car when they arrive at a show. Set me up, and I am sure I will be able to send them all your way!